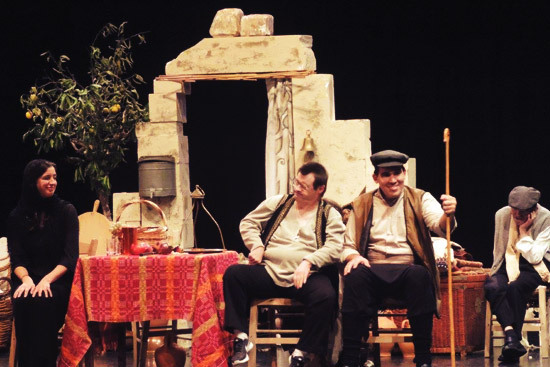 which is organised by the Panhellenic Professional Society of Dramatherapists & Play Therapists (PPSDP). The Conference will be held on 19-20 May, 2018 at the Athens School of Fine Arts. The Conference is aimed at mental health practitioners, social scientists, psychotherapists- counsellors of various modalities, educators, students from respective fields, as well as at individuals interested in enhancing their personal growth and enriching their knowledge on this subject. 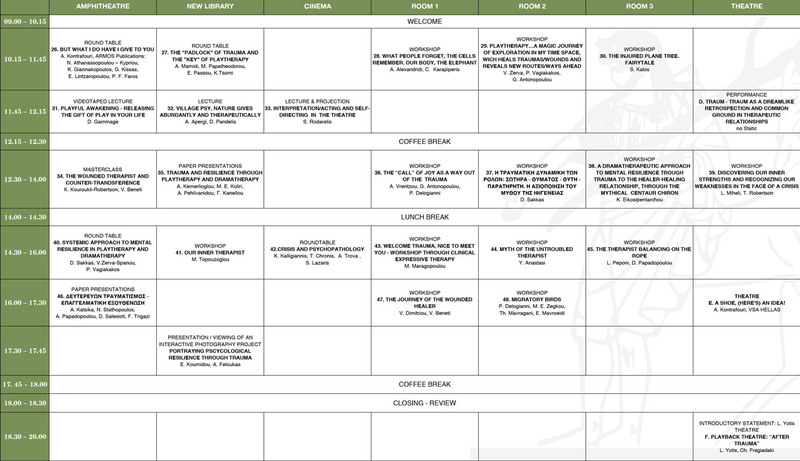 The scientific agenda of the Conference includes verbal announcements from distinguished speakers both from Greece and abroad, workshops, theatrical performances, posters and parallel actions. The themes of the Conference revolve around how the therapeutic relationship helps to build resilience as a response to trauma. Our aim is that this Conference will become a meeting place for various multidisciplinary teams and therapeutic approaches so that the scientific dialogue can be promoted while new research questions will be addressed. We cordially invite you to attend the Conference and actively participate in its sessions, and look forward to paving the way for a common forum where innovative ideas and experiences will be shared, convergence will be promoted, and new crossroads regarding personal, professional and social challenges will be created. by April 12, the latest. 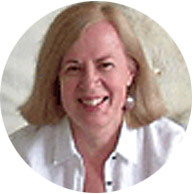 Anna Seymour, PhD PFHEA, is Professor of Dramatherapy at the University of Roehampton, London. She is an HCPC registered Dramatherapist, clinical supervisor, theatre scholar, and Dramatherapy trainer. She is a Principal Fellow of the Higher Education Academy. As a Dramatherapist and Clinical Supervisor she has worked in the NHS, Voluntary and private sectors with a range of clients and issues. She has a particular interest and personal experience in working with adoption and attachment issues. Anna is an international trainer and a consultant to several Dramatherapy programmes across the world. She has a background in professional theatre for communities, where she was involved in more than thirty shows as an actor or director. She appeared in the 1984 BBC, BAFTA award winning, film Threads. Her work has encompassed projects with people of all ages and abilities. She has worked in a wide range of settings with musicians and documentary theatre makers and has facilitated workshops and training for fellow professionals on working in community settings. She trained in Commedia Dell’Arte in the UK (with Michael Chase), France (with John Rudlin) and Italy (with Antonio Fava, 2011), which she has taught internationally, and in Meyerhold’s Biomechanics with Gennadi Bogdanov, Moscow Theatre of Satire. 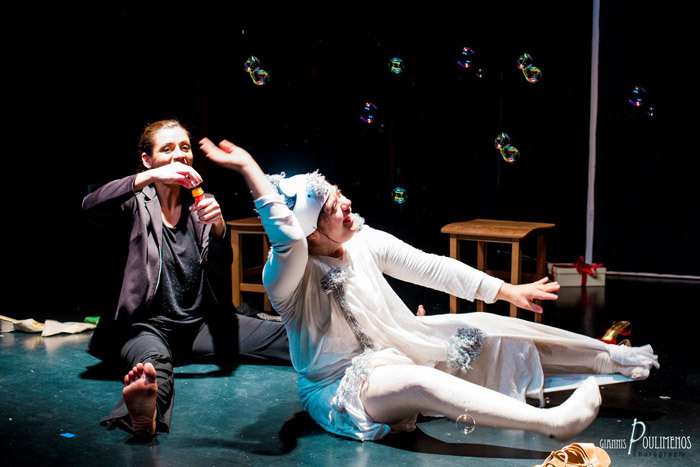 As a theatre scholar she has worked in the Drama departments of the Universities of Manchester, (including five practical research projects working with classical dramatic texts), Birmingham (Teaching fellow in Drama 2009-10), Hull, Huddersfield and Sheffield. 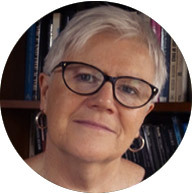 Anna was Editor of Dramatherapy (2011-17) peer reviewed Journal of the British Association of Dramatherapists (Routledge/Taylor and Francis) and is a founding member of the Editorial advisory board Drama Therapy Review (Intellect). 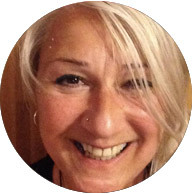 Yolande Anastasi graduated as a Dramatherapist from Roehampton Institute in 1999. Since then she has been working clinically with both adults and children in a variety of settings including psychiatric day hospital, family services unit, domestic violence unit, schools and private practice. She has also been supervising clinical work since 2005. Yolande developed and facilitated a series of training workshops at children’s charity Kids Company for 15 years, which supported students on placements with children. 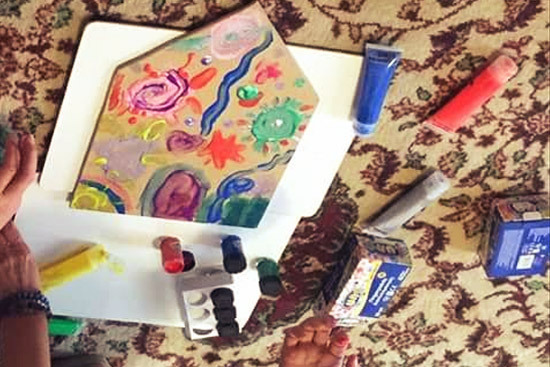 These trainings were rooted in attachment theory, and promoted the use of all the arts in therapy. 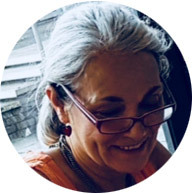 Yolande has a continued interest in sharing new developments in psychotherapeutic thinking to a wider audience and has facilitated “An Introduction To Dramatherapy” for a leading children’s charity Place2Be and ran a weekend module for the Athyrma Play and Dramatherapy course in Athens. Yolande is also part of the team supervising groups on a child psychotherapy training programme. 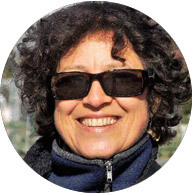 Susana Pendzik (Ph.D., RDT) is Head of the Drama Therapy Graduate Program at Tel Hai Academic College, lecturing also at the Hebrew University of Jerusalem, the Dramatherapy Institute of Switzerland, as well as other institutions of Higher Education in Europe, Latin America and the U.S, and conducting workshops worldwide. 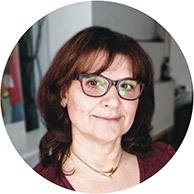 Susana is founder and honorary member of the Swiss Dramatherapy Association, accredited supervisor by the Israeli Association of Creative and Expressive Therapies, representative of Israel at the European Federation of Dramatherapy and at the World Alliance for Dramatherapy. 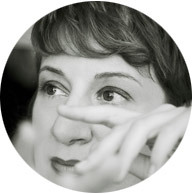 A published poetess, theatre director, and researcher, Susana is the author of many articles in the field, a book for using action techniques with abused women, co-editor of the volume Assessment in Drama Therapy (2012), first editor of The Self in Performance: Autobiographic, self-revelatory, and autoethnographic forms of therapeutic theatre (Palgrave Macmillan), and co-author of a dramatherapy book in Spanish to be published in 2018. I have pioneered Dramatherapy and Playtherapy in UK and Europe and established it as a postgraduate practice. I am a full/founder member of the British Association of Dramatherapists, State Registered with the Health Professions Council, full member of the British Association of Play Therapists and Play Therapy UK. I am also a full member of the National Association of Drama Therapy (USA). Currently I have written over 30 books on Dramatherapy, Playtherapy, Storytelling, Puppetry, Groupwork, Fertility, Ritual, Folklore and Theatre published by: Routledge, Jessica Kingsley, Speechmark (Winslow Press), Chrysalis (Vega) and OUP. Several books are translated into: Hebrew, Greek, Italian, Danish. Korean and Russian. I have also made videos of Dramatherapy theory and practice. Virginia is the former director of the MA/Diploma in Non-directive Play Therapy at the University of York–with the course offered, before finishing, in both England and Ireland. Virginia was honoured to receive BAPT’s Lifetime Achievement Award in 2012 ‘in recognition of an outstanding contribution to Play Therapy’, and regularly gives international and national conference addresses, workshops, and training days on play therapy, filial therapy and related topics. Virginia’s books and journal articles on play therapy, filial therapy and statutory issues include a co-authored book with Louise Guerney, Group Filial Therapy (2013), and two books with Kate Wilson, Case Studies in Non-directive Play Therapy (2000) and Play Therapy: A Non-directive Approach for Children and Adolescents, 2nd Edition (2005). Before training as a dramatherapist, I worked as a residential social worker in London. I was practising dramatherapy before I knew it existed and I could actually train to be one! My work as a dramatherapist and play therapist has included working for the NHS, for the NSPCC and other charities, in local authorities and in private practice. I am also a trainer of dramatherapists and play therapists and a clinical supervisor. For two years I ran a one-year programme called Play and the Creative Arts Therapies with the intention of developing this into an MA in Play Therapy based in Devon. I decided not to pursue this plan as I knew I did not wish to become an administrator. My heart is in being a therapist. After almost three decades of practice, I can feel myself moving more into research. It is becoming time for me to move back and let the next generation of dramatherapists and play therapists take the lead. Writing Playful Awakening I believe heralded this shift away from ‘the front line’. I am, of course, wholly committed to the clients I currently work with and always open to ongoing training. I would also like to pursue developing my theatre company Potential Space as I have been bequeathed a play by a very dear friend who passed away in 2017 and I would like very much to stage this play. Dramatherapist – Psychotherapist. Born in Greece, raised and educated in the United States of America. Certified member of the European Association of Psychotherapists (EAP) and member of the Board of Directors of the Panhellenic Professional Association of Dramatherapists and Playtherapists. Graduate of Sociology & Literature from Virginia Commonwealth University, Richmond, Virginia, USA and the American College of Greece. Attended numerous seminars and workshops facilitated by Greek and foreign trainers, completed an annual workshop in theatrical play (Lakis Kourentzis), and a three-year training program on “Genealogical Data Analysis” – an important healing intervention. 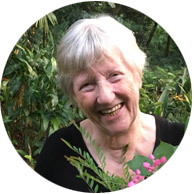 After completing a long career in a multinational environment, her interest in creative expression, personal development and the healing properties of art led her to further her training in art therapy, specializing in Dramatherapy (“Herma” Institute of Dramatherapy and Playtherapy). She has worked with individuals suffering with Down syndrome and intellectual disabilities (Special Vocational Training Center “ESEEPA”), and mental disorders (St. George’s Psychiatric Clinic). Furthermore, she has facilitated workshops abroad, within the framework of an EU program using art as a means of connecting and communicating. Today, she conducts individual & group sessions, and develops-facilitates theoretical seminars and experiential workshops. She is a trainer and supervisor to Dramatherapy practitioners as well as facilitator of “The Foundation Course in Dramatherapy & Playtherapy” at “Herma” Psychotherapeutic and Educational Center. Dr. Κaterina Couroucli-Robertson was born in England and brought up in Greece by her English mother and Greek father. She is a psychotherapist with a Ph.D. in Dramatherapy from Surrey University. She is also a teacher in special education. 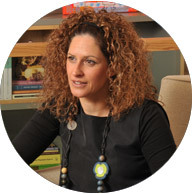 She is Head of Studies at the Herma Institute of Dramatherapy and Playtherapy and an external lecturer at the University of Thessaly. She is also the director of a theatre group for V.S.A. 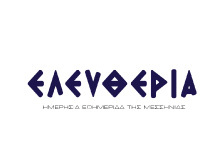 Hellas (Very Special Arts) made up of people with and without learning difficulties. She has published numerous articles on Dramatherapy as well as the book ‘Before You Let the Sun in’, written in collaboration with her husband Ian Douglas Robertson, which comprises a collection of stories based on her work as a Dramatherapist. This was published in Greek by Nefeli in 2014 and will be coming out in English May 2018 by Aeon Books. In 2017, Karnac published Larger Than Life, based on her PhD thesis, which deals with six women and their struggle with obesity. 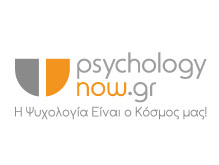 Antigoni Kemerlioglou is a Psychologist- Play Therapist. She has a BSc in Psychology (University of La Verne), an MSc in Psychology & Health (University of Stirling, Scotland), and an MSc in Psychology of Education (Institute of Education, UCL). She has further training in Play Therapy (“ATHYRMA”), and supervision in Play & Drama therapy (“HERMA”). Professionally she has collaborated with Centres of Psychosocial Support as a Psychologist for a great number of years. 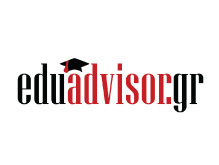 She has teaching experience in British and American University programmes held in Greece in the domains of Psychology and Counselling. In addition to that, she has been responsible for the design and co- ordination of academic programmes both in colleges and in collaboration with the representation of the European Commission in Greece. She works for ”HERMA” as an instructor, facilitator and supervisor at the Play Therapy programme. 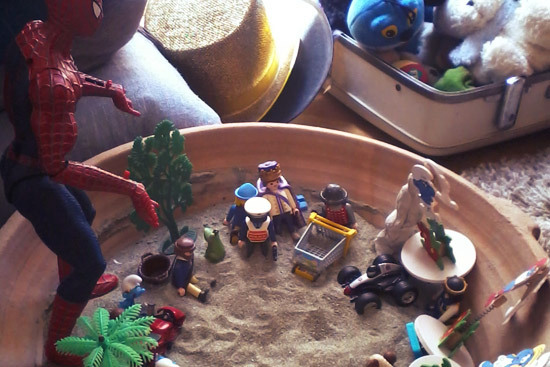 At the same time she works privately as a Psychologist- Play therapist where she sees children, parents, adolescents and adults, and provides creative supervision for psychologists, psychotherapists, and mental health specialists. She collaborates with kindergartens conducting experiential workshops with preschoolers while co-ordinating parental group meetings. She participates as a guest speaker in conferences. 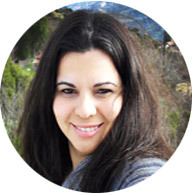 She is a member of the Association of the Greek Psychologists and vice president of the Panhellenic Professional Association of Dramatherapists & Play Therapists. I was born and raised in Athens. I studied psycology, I got the degree of Higher National Diploma For Care Practice and obtain Bachelor of science in Psychological Studies in PRESTON UNIVERSITY USA. 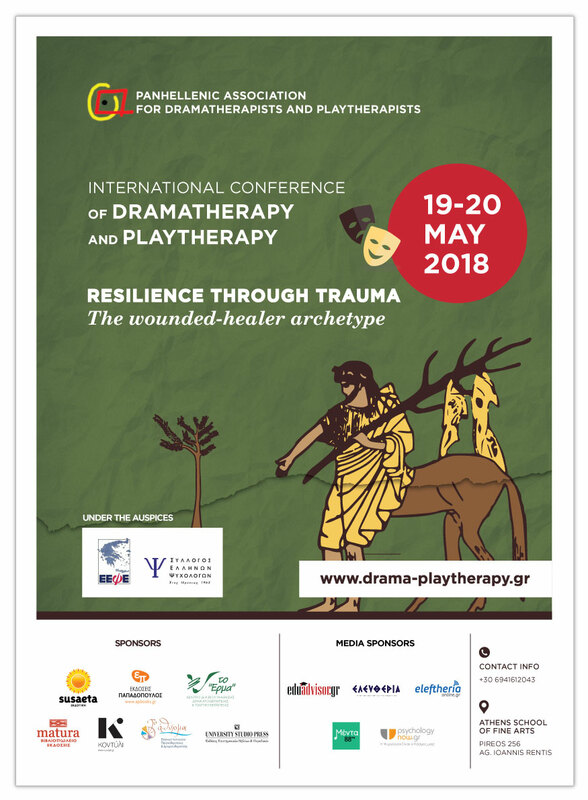 My postgraduate education concerns the pcycotherapic approach of dramatherapy at the greek institute of play and drama therapy ”to athirma”. 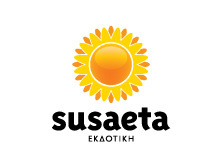 During and afterwards my studies I collaborated with: the psyciatrical clinic of Athens ”Dromokaitio”, the day care for people with special needs ” Estia”, the alpha programme of ”Κethea” for people with alcohol addiction and finally with the center of learning dissabilities ”leksis and praksis”. 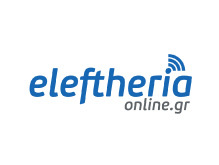 Today I collaborate with the psycotherapy and psychosial rehabilitation center ”mythia” and I also maintain my own personal office, for psycotherapy and education, named ”Entelehia” in which children and adults can participate, either indivitually or in groups, to theoritical or experential seminars of dramatherapy. I was born and raised in Athens, in a neighborhood where play was still carefree to children. Questions to my childhood found space to be taken care of, years after, while studying Psychology at the Panteion University of Athens, and later on Dramatherapy in the “Athyrma” Greek Institute of Playtherapy and Dramatherapy. In my professional course, every “stop” turned into precious “luggage”. I collaborated with the “Alkyoni” Foundation for children with disability, the KETHEA “ALFA” program as well as the “Chatzikonsta” Foundation and academically with the DELTA Vocational Institute. 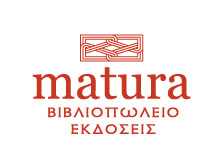 At present, I am working privately at the “Mythia” centre of Psychotherapy and social rehabilitation, coordinating individual and group therapeutic sessions, while at the same time I work as a tutor in the “Athyrma” Greek Institute of Drama and Play Therapy as an official Member of the Greek Psychologists Association and President of the Panhellenic Union of Dramatherapists and Playtherapists. Irini Zeri studied Psychology at the New York College of Athens. 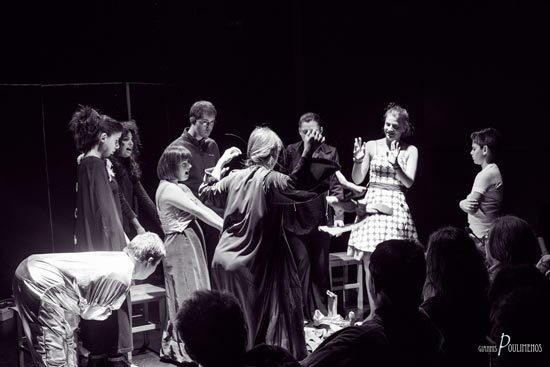 She continued her studies at the Theater of Changes, at the Hellenic Institute of Play Therapy and Dramatherapy “Athyrma”, and she has also completed the three-year workshop of Physical Theater “Plefsis”. She has coordinated programs of emotional and social education in kindergartens and enrichment centers, and she has also worked as a theater animator in special education. She has worked at the Publishing House Metaichmio. 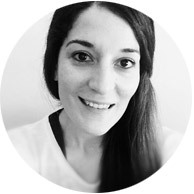 Recently, she is working as a play therapist for children with emotional or behavioral difficulties and she is a member of the Panhellenic Professional Society of Dramatherapists & Play Therapists (PPSDP). She is involved in performing arts (dance and theater). She had been a founding and active member of the theatrical team “Plasters” for three years, while today she performs in psycho-social performances with the team “No Static” and participates as an actor in plays for kids with the team “Ekontes”. She coordinates experiential workshops for children and adults. Actress, Game Therapist, Drama Therapist. Aristea Kontrafouri graduated from “Archi” drama school by Nelly Karra. 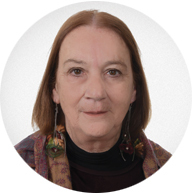 She studied special education and specialised in play therapy (Hellenic Institute of Play Therapy and Dramatherapy, Athyrma) and in Dramatherapy (Psychotherapeutic and educational center of lifelong learning HERMA). 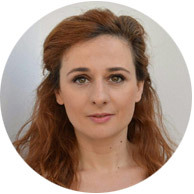 She is an official member of EAP (European Association Psychotherapy) and member of Panhellenic Professional Society of Dramatherapists & Play Therapists (PPSDP). She is a founding member of the psychomotor development venue “To Nima (thread)”. She cooperated with many troupes and she was in the core of the “Experimental Scene” of the National Theatre of Greece, starring in many plays. She has taken courses in vocal and breathing training having Mirka Gementzaki as her instructor. She joined the team of “Prasein Aloga” visual puppet theatre by E. Kapokaki in 2003. In 2004 she cooperated with “Theatre of a shoe upon a tree” and she adapted the fairytale “Cinnamon and Spearmint”. 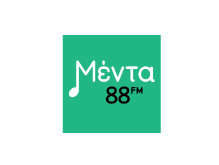 She has taken courses in kinetic improvisation instructed by Aggeliki Stellatou. She is an instructor of theatre games to children with special needs of “Panevoikos Association Human, Hope and Culture” in Halkida, where she has written and directed the plays: “The country of Stars”, “The trunk” and “The Beatles’ yellow submarine and the little jar of jam”. She has also directed for the same group: “A sea of emotions or where has love gone?” based on “the Island” by Manos Hadjidakis, “The fisherman and his soul” by Oscar Wilde and “The Island of Slaves” by Marivaux. She cooperated as a play therapist with “Litharaki” day centre of Attica paediatric psychiatry hospital for autistic and psychotic children. She is a coordinator of the play theatre group of “Very Special Arts Hellas” where she stages plays which she adapts dramatically. Her voice has been used in dubbed TV series. She has cooperated with special therapy centre “Journey to development”. She teaches drama with play therapy techniques and drama therapy at psychotherapeutic and educational centre “Herma”. 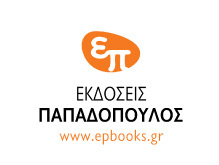 She was a columnist with “What I feel (Afto pou esthanome)” in “Explorers (Exerevnites)” of “Kathimerini” newspaper. She directed the fairytales of Christos Bouliotis “The girl who asked a needle, a simple needle” and “Tom Tiritom and the state which was divided in two parts” where she also has a leading role. I was born in Athens and I grew up in Piraeus, overviewing the sea. 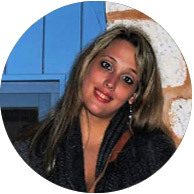 I wanted to interact and work with people since I was very young and that is why I studied Social Work at Technological Institute of Athens. Later, I attended a training course on Dramatherapy at “Athirma” a Greek Institute of Playtherapy and Dramatherapy. I have attended a series of seminars about psychology and psychological problems. I have been working in Public Social Institutes and Special Therapy Centers for almost 12 years. I have treated as a professional different groups of people such as mentally retarded, elderly, lonely and psychologically unstable people of all ages. At present, I have been working at the Municipality of Piraeus and I am a freelance at the Therapeutic Centers “Ellogon” and “Mythia”. In 2017, I wrote the fairytale “The journey of a tiny, little scribble” that is published by Kondyli Publications. I am an official member of the PanHellenic Profession Union of Dramatherapists and Playtherapists. A. 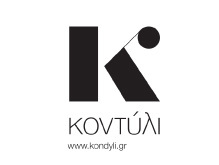 ART EXHIBITION by K.Michalos, G.Poulimenos, P. Nikolakopoulou & G. Asimakopoulou. B. INTERACTIVE PHOTOGRAPHY PROJECT: PORTRAYING PSYCHOLOGICAL RESILIENCE THROUGH TRAUMA by E. Koumidou, A. Feloukas at the THEATRE FOYER. 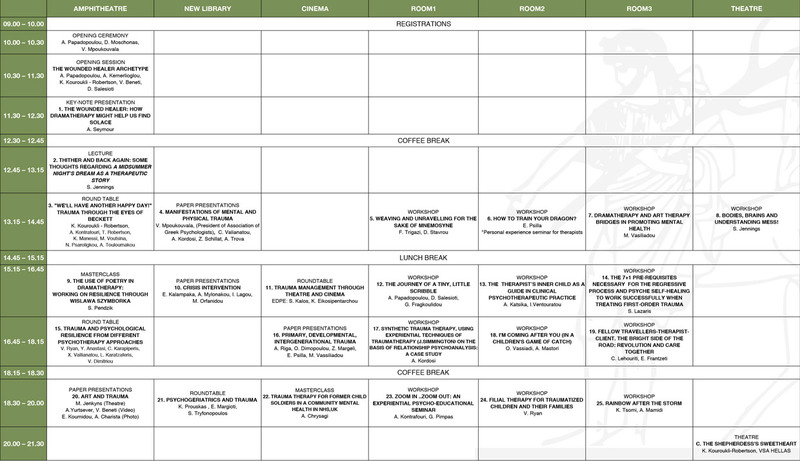 Hours 15.00 – 18.0. *Participants will recieve a “Certificate of Attendance” on Sunday May 20th, upon submission of the “Conference Evaluation Form”.